“Exports and Education” should be the Australian Government’s budget mantra, not “Jobs and Growth” or “Fairness, Opportunity and Security”. Neither defines the Australian problem as does “Education and Exports”. Export income is the key to Australia’s future prosperity and the control of its annual deficit. The problem is Australia does not produce enough income to meet its expenses. Australia’s national debt as at April 2017 now stands at $552 billion (RBA) and the Reserve Bank of Australia must keep interest rates down in order to minimise interest repayments and to promote economic activity. It is not enough to promote jobs without putting the emphasis on export income which will create a strong balance of trade to reduce the monthly trading deficit. Unless this happens, there will be a slow devaluation of the currency which will only assist the export industry if it does not rely on overseas inputs. 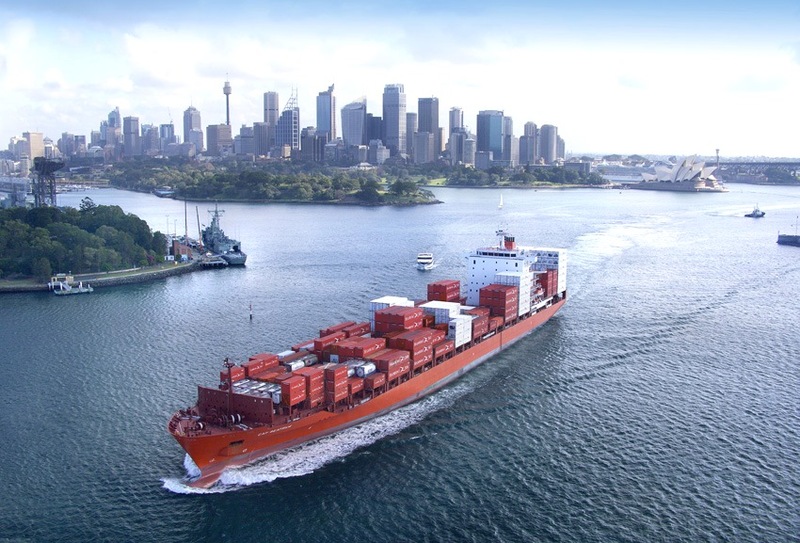 Strong exports are the key to Australia’s future. 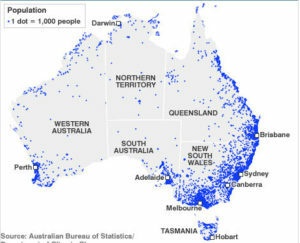 Australia’s problem is well illustrated in the population density map of this island continent. The virtually unpopulated inland produced 60% in 2014 of Australia’s export income derived from natural resources and farm produce (beef and wheat). 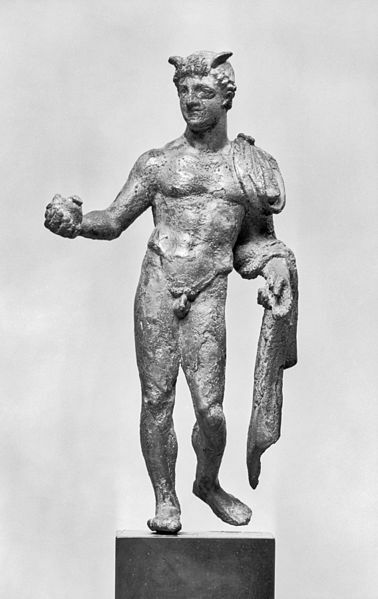 Another 9% was derived from education and tourism. The remaining 31% came from financial services, agriculture, chemicals, pharmaceuticals and specialised engineering products. 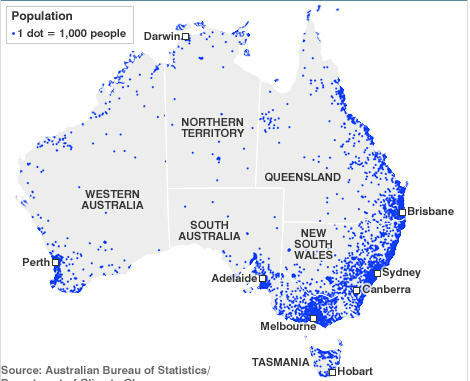 Australian Population Distribution (ABS) 1Dot = 1000 People. AUSTRALIA”S TOP GOODS AND SERVICES EXPORTS (DFAT 2014) TABLE ! Currently, significant export growth can only come from non-labour intensive industries such as specialised engineering, medical advances, pharmaceuticals, chemicals, food products and legal services. The financial services sector will face increasing competition from Singapore and Hong Kong. The ABS 2016-17 Budget Figures for Australia define a problem: within the expenses are costs for health – $71 billion, social security – $158 billion, that is $229 billion which is 55% of Government revenue. In the long term this is unsustainable, clearly export income is a priority. The Gratten Institute (CEO, John Daley, April 2013) has concluded that Australia will face a decade of budget deficits, adding to this problem the proposed corporate tax cuts could exacerbate this problem if the American experience is considered – see below. 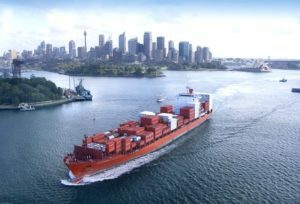 In assessing Australia’s long term export potential, two factors will ensure interest rates will remain low due to a continuing sluggish economy and the continuing annual deficits which will put Australia’s credit rating at risk. 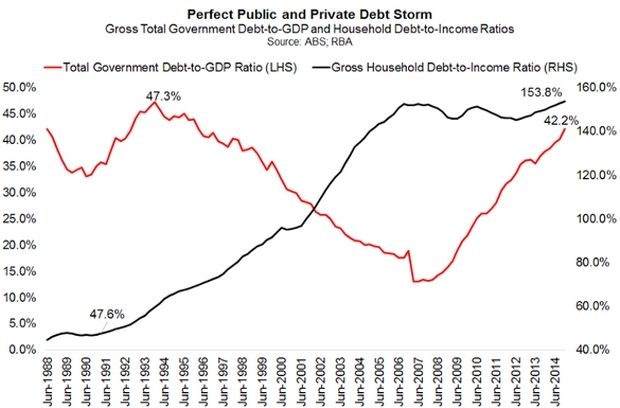 These factors are the explosion in public and private debt and the Government debt to GDP ratio and its relevance to Standard and Poor’s ratings – see below. Australia’s looming problem is the inexorable rise of the Public (Government) and Private. 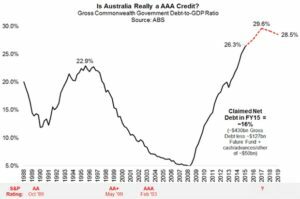 debt, as far back as 2007 the RBA warned of this dangerous situation when debt was only $58 billion. 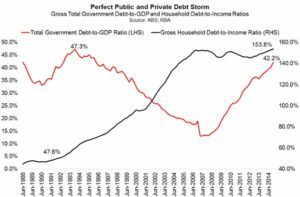 As of April 2017 this figure has risen to $552 billion while Private debt stands at $2.7 trillion and both rising, (RBA and Debt Clock). Interest payments on Government debt will rise from $17.6 billion in 2016-17 to over $20 billion on a projected debt of $659 billion by 2020 (The Australian, MYEFO 20 December 2016). The continuing low interest rate (1.5%) and the sluggish economy are not conducive to generating a strong export-led economy. The opinion emanating from Union Bank of Switzerland is that increasing debt and continuing budget deficits might place further pressure on Australia’s AAA credit rating. Should there be a downgrade there would be a serious rise in annual interest payments. 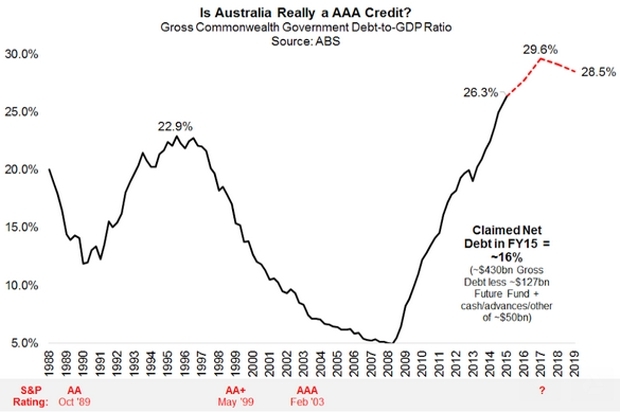 The figure below illustrates Australia’s vulnerability to a credit rating adjustment leading up to 2020. S & P AA AAA AAA ??? Data on Australia’s top ten trading is revealing – there is imbalance and emerging concerns. There are two concerns. Firstly, there is obviously a disproportionate reliance on coal and iron ore for export income. There will be a slow global decline in coal usage as alternative energy sources come on stream. With iron ore there are vast new iron ore deposits being opened up in Africa and South America. Regarding iron ore deposits in Brazil, it is concerning that the Chinese government has indicated it is increasing production from this source in order to reduce Australia’s near monopoly on iron ore supply. Secondly, the Australian services sector representing 49% of export income, employs 80% of the work force. By implication, natural resources and agriculture which produce 51% of export income employs only 20% of the work force. (See Table below). If Australia is to prosper these statistics must change. It is well documented that the “trickle down” effect does not apply to nations blessed but ultimately cursed with natural resources. The above projected growth rates are significant taken in conjunction with the extent of Chinese investment and obviously ongoing acquisitions of Australian assets. Examples are – the dairy, wine, beef and power industries. (See Chinese Foreign Investment, May Blog, 2016) It should now be clearer why Darwin port is currently controlled by Chinese interests. Darwin will become an important periphoral to the Chinese One Belt One Road expansion policy. If Australia is to increase export income and provide secure power for its export industries, it will have to take a more hard-nosed approach towards the oil, coal and gas potential of this continent. One of Australia’s problems is the rising under-employment and slowly falling standards of living among the citizens, not the political elite. Queensland is desperate for coal development and jobs in the Galilee Basin; South Australia would benefit from oil exploration in the Bight (abcnews.com 16 November 2016); New South Wales, Victoria and Western Australia would no longer be facing a power crisis if shale gas production was encouraged. When only a few hundred jobs may be created in any part of the country becomes newsworthy, one wonders how thousands of jobs and billions in export income can be foregone by lack of firm Government policy. The Government is desperate to encourage “Jobs and Growth” and yet projects are stalled or delayed despite stringent safeguards. Postamble Australia has been blessed with the curse of natural resources. The past is now stalling our future. Global studies have proved that economies with abundant natural resources tend to industrialise less rapidly than natural resource-scarce economies (NBER Working Paper 5398, 1995). For Australia to materially generate nation wide export growth, OECD education ratings must be significantly improved, the Davos findings on STEM expertise must be addressed and university funding must be increased to permit export directed research. Postscript This month much has been made of Australia’s recession-free growth during the past two decades by the Treasurer. Looking behind this soothing statement there should be concern not euphoria. The construction industry did indeed inflate the GDP, however, it did not contribute to export income unless there was massive foreign investment. 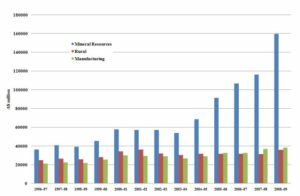 The image below illustrates Australia’s dangerous reliance on mineral exports over the past twelve years. Currently the value of mineral exports is decreasing as China’s demand weakens and this will reinforce the inexorable slow decline in Australian living standards, this will continue unless alternative exports can be generated. The Treasurer’s statement obscures this real unpalatable truth but is in keeping with my September 2016 article ‘The Australian Economy – Stupid’. “The latest resource boom which commenced in 2003 has already doubled Australia’s terms of trade and is slated to go higher due to oil and gas exports. 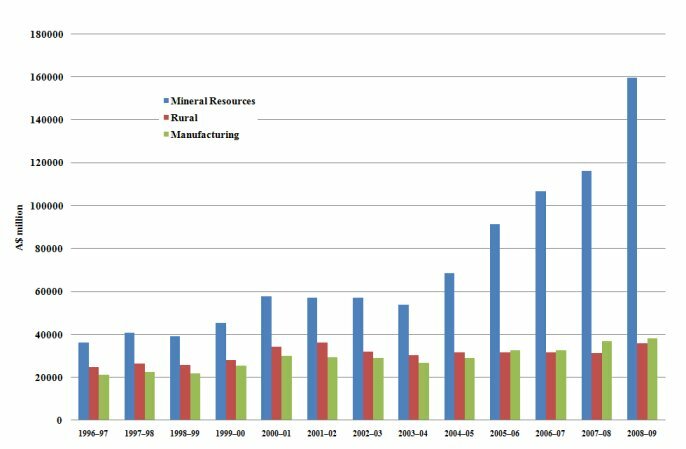 The growth in mineral commodity exports since 2003 has been phenomenal. Iron ore increased from $5.3 billion to $34 billion (2009) while coal (steaming and metallurgical) increased from $10.9 billion to $34.7 billion (2009). This cannot continue. Australia has to throw off the curse of relying on natural resources and encourage specialised manufacturing, rural production, university research and education export income otherwise Australia’s standard of living will continue to decline. With inflation at 1.5%, wage growth at 1.9% and a sluggish economy at 2.4 % growth, the May budget may do little to lift Australia out of Government’s current fiscal morass.